ESCROW means that a transferor, contractor or debtor hands over relevant legal instrument such as deed, money, stocks or other assets to a third party for safekeeping, and the third party will return the legal instrument or assets to the former when the agreed event or conditions are met. ESCROW services include overseas custody of funds, securities, deeds and other assets for domestic investors, or domestic and overseas custody of such assets for foreign investors. According to different subject matters under custody, ESCROW services can be classified into ESCROW service for funds and ESCROW service in kind. 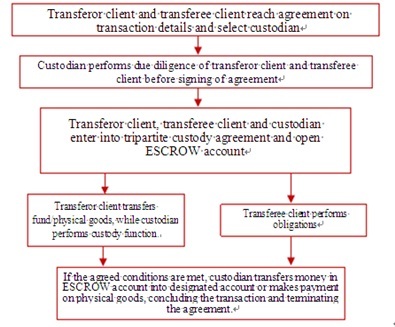 ESCROW services are widely adopted in various fund receipt and payment activities, such as cross-border commodity trading of domestic and overseas enterprises, use of earmarked funds, share transfer, M&A, debt restructuring and intermediary services. A custodian bank, as both a credit agency and payment agency, aims to eliminate the distrust between the parties for a transaction to the maximum extent, reduce default risks and help clients conclude transactions smoothly. Objectively, customers have demands for ESCROW services, as Chinese market is furthering its opening-up to the outside world, more and more foreign institutions are investing in China and vice versa, and Chinese enterprises are increasingly expanding their global businesses. The ESCROW services provided by ICBC mainly target at: domestic and foreign companies with an intent for cross-border restructuring, expansion, sale of assets or M&A; domestic and foreign companies with the need for cross-border trading, payment for goods, services or funding; foreign investment banking institutions, venture capital, private equity companies, and large-scale multinationals. i. Account opening: open a separate ESCROW account. ii. Asset custody: provide asset custody service for funds, securities and deeds, to ensure the safety and independence of customer’s assets, and effectively prevent asset misappropriation risk. iii. Fund receipt and payment or payment in kind: transfer funds to the account designated by customer or make payment in kind to the party designed by customer according to the custody agreement and the fund transfer instructions delivered by receiving and payment clients. iv. Foreign exchange conversion: handle foreign exchange settlement and sale according to relevant foreign exchange control regulations at home and abroad, so as to help customers conclude transaction successfully. v. Cash management: provide cash management services including fixed-income investment and interbank placement (if requested by customers). vi. Custody reports: provide customers with periodic custody reports on various assets (if requested by customers). i. As the largest custodian bank in China, ICBC has maintained its leading position in the market for 18 consecutive years in terms of market share of asset custody business. ii. It is also the most professional custodian bank in China, with an advanced custody service system independently developed by it. The system has obtained ISAE3402 authentication (formerly known as SAS70), the first one of its kind in China, indicating that ICBC’s internal control of custody services has met international standards. iii. Extensive customer service network. All the tier-one (directly affiliated) branches of ICBC have launched asset custody service, thus convenient and efficient custody services can be provided to customers by means of more than 16,000 branches and widespread outlets.